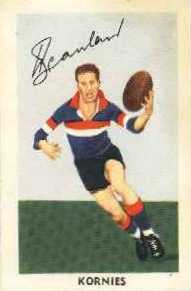 BILL SCANLAN was Footscray's centre half-forward for most of last season. With his brother, Frank, he was cleared by Melbourne-in 1948. 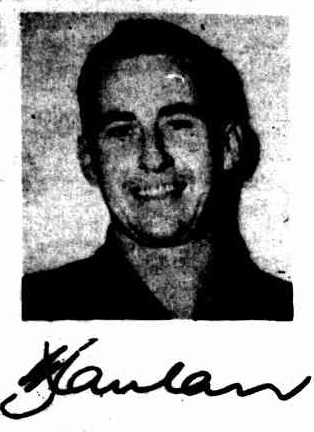 Bill came from Sandringham Colts, and played his first game with Melbourne in 1943, his tally with that club being 39 games and 23 goals. He played every game with Footscray last year. Footscray will admit that Bill is not fully equipped as a player, but he is a superb mark, and, for the first time for years, Footscray players have confidence in kicking high to the half-forward line, because they know that Bill has more than an equal chance of marking it. He is not a good kick, but seems to have improved since he left Melbourne. Bill plays golf well. Like so many boys who lived at Sandringham, he did some caddying in his spare time, and seems to have copied the stars in his natural and free swing. He is a railways man, employed at Toorak, and lives with his family at Sandringham.